Amazing! Every knitter should get one! Self striping yarn project FINISHED! READY! FO! I have just gotten my amazon.com order. Our new postman is so lazy, this week he needs to rest (I got this shocking information from a “blonde” voice when I called the post office). I had to go myself to a post office in Bağlar Mevki (damn it, this city called Istanbul is sooo big with sooo many intricate streets). It was a real adventure with my poor Turkish to understand the instructions given by the people on the street. Well, I know how to ask “how do I get to….”, but the problem is the answer I get. Turkish people like to help a lot, especially if they see you foreigner, but English language is still an issue here, especially in some neighborhoods. And my issue is Turkish language, the many dialects from different counties (I think even after 10 years of living in Istanbul I won’t be able to understand what my husband’s relatives from Rize are saying). Anyway, now I the happy owner of a copy of a Vogue Knitting: The Ultimate Knitting Book (Hardcover) . My first impression after flipping some pages: I have knitted very amateurishly till today. Reading this book will improve my knitting dramatically. I am very sure about this. This book makes me see knitting in a total different way: a professional way. 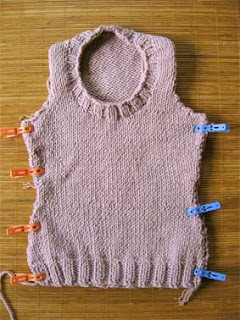 I especially love the part that teaches you how to design and “think” your knitting. The book is thick indeed and every single page is a source of useful information. I think its price on amazon.com is more than fair. I am very happy because I bought it. Highly recommended to every (English speaker) knitter in the world. Now, when this bulky yarn project is almost finished, I realized or, better say, I recalled that bulky yarn is not recommended for fitted projects. But, it is too late and the damage doesn't look so bad. There is a bright side too: it is cold outside and I have always wished for a tank. Since it is knitted plain, without any motif (bulky yarn...), I am considering some embellishments. Picture of the FO later... on other post. My first felting project is a big failure but it has helped me discover the best yarn in the world! I really love the look and the feel of felted knitting. I had wanted to have a felted small black pouch so I visited my favorite yarn store and got one skein of 100% wool. The lady from yarn store was talking and talking about the high quality of the yarn which made me think this is just an excuse for the high price.So, knitting with this yarn has been very easy and fast. 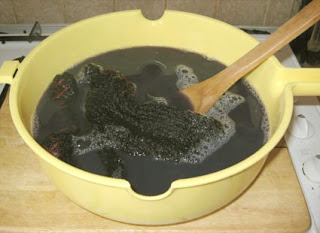 I also have gathered lots of information about felting, how to do it at home, details, techniques, so on, therefore I was very sure this project would be a 100% success…. For two days I tortured this yarn (pouch): spinning it in washing machine many times, keeping it in boiled and soapy water, then using a very hot iron on it. I am pretty sure that even in factory the tests are not so rough. During the felting process I was using some jeans which now are in very bad condition, but the pouch is like new! Like nothing happened to this yarn! I am flabbergasted, I am amazed! I can't understand why this stubborn wool would not felt. I went to the yarn store and the lady owner tells me: “I’ve told you it’s a high quality yarn. Try some other cheap yarn, this brand is too good.” What can I say? This is like the “X-files” mystery. But frankly speaking, there are some yarn brands here which are outstanding. Usually I am very grumpy and very critical in the yarn stores; but I can’t find any small reason to complain about yarns of some local brands. Their quality, the easiness of knitting, the feel and look, the color selection, the resistance of fiber – they are truly amazing. 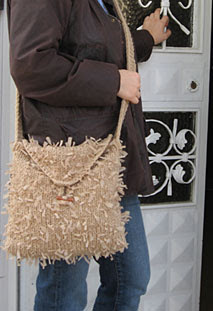 It is pity that Turkish yarns are not popular worldwide. At the beginning of my knitting I was feeling a kind of unlucky because I can’t easily purchase Berroco, Rowan , Debbie Bliss or some other famous brands. Getting in Turkey a VogueKnitting magazine is a miracle. It happens very seldom. But I discovered amazing yarns here. 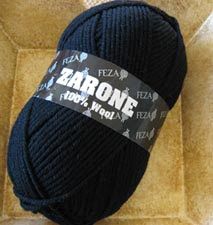 I would highly recommend “Feza” yarns to every knitter in the world. 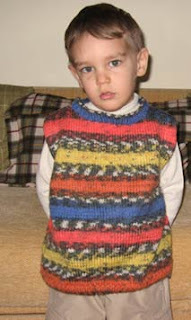 As you can see, my son is already wearing the vest knitted with self striping yarn. So, from my experience, I recommend self striping yarn only for knitting bags, totes, tanks, blankets, throws, scarves, shawls, pillows. 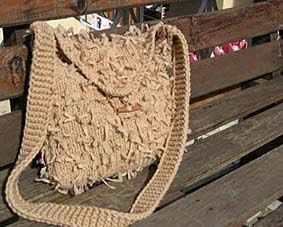 My first knitted bag is ready. I used 2 types of yarn: classic (20% wool, 80% acrylic) and novelty yarn. Two squares sewn together, a flap decorated with a crochet edge, a wooden button. That's all, very simple, very easy, very pretty. I was so proud of my last knitting achievement so I took and showed it at a yarn store: the shop owner liked it so much. She said it wasn’t for the very first time when she saw entrelac but she had never tried before because of the lack of enough instructions. I was asked, when available, to share the “knowledge of entrelac making”. That day I felt I am growing bigger because, frankly speaking, I started to seriously knit just 2 months ago. I have neighbors who have been knitting for 40 years, but entrelac is still a mystery for them. Not because of lacking skills, but possibly because there is no will to learn something totally out of ordinary, here, in Turkey. Sometimes this reality makes me sad, because the “raw material” has very high quality but the willing is missing yet. Of course there are a few exceptions as well. While teaching the yarn store owner entrelac technique, I learned some tricks from her. I will share with you some of them in my next posts. Finally I’ve done it! My first entrelac knitted piece. Last year I saw in VogueKnitting mangazine fall 2006 (page 42) an article about entrelac workshop. It was first time when I saw entrelac. It was love at first sight…. and only this because the article was so loooooong (5 pages) and I have no patience at all. 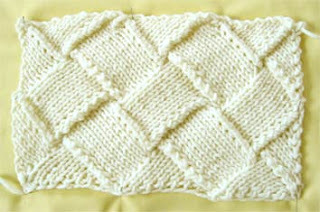 That day I decided that entrelac was nice but it seemed too difficult and troublesome for me to try it. Later on, while surfing the net I found some blogs with detailed information about entrelac technique. Unfortunately the instructions have errors (my personal opinion) but I combined the information from VogueKnitting magazine and from blogs. Finally, I managed to finish my first entrelac knitted work. Tadaa!